Drive Axle for Forklifts - A forklift drive axle is a piece of machinery that is elastically affixed to a vehicle frame with a lift mast. The lift mast is fixed to the drive axle and could be inclined round the drive axle's axial centerline. This is accomplished by at the very least one tilting cylinder. Forward bearing components combined with rear bearing elements of a torque bearing system are responsible for fastening the drive axle to the vehicle framework. The drive axle can be pivoted round a swiveling axis oriented horizontally and transversely in the vicinity of the rear bearing components. The lift mast can also be inclined relative to the drive axle. The tilting cylinder is affixed to the lift truck frame and the lift mast in an articulated fashion. This allows the tilting cylinder to be oriented almost parallel to a plane extending from the swiveling axis to the axial centerline. Lift truck models like for example H45, H35 and H40 which are produced in Aschaffenburg, Germany by Linde AG, have the lift mast tilt capably attached on the vehicle frame. The drive axle is elastically attached to the forklift frame utilizing a multitude of bearing tools. The drive axle comprise tubular axle body together with extension arms affixed to it and extend backwards. 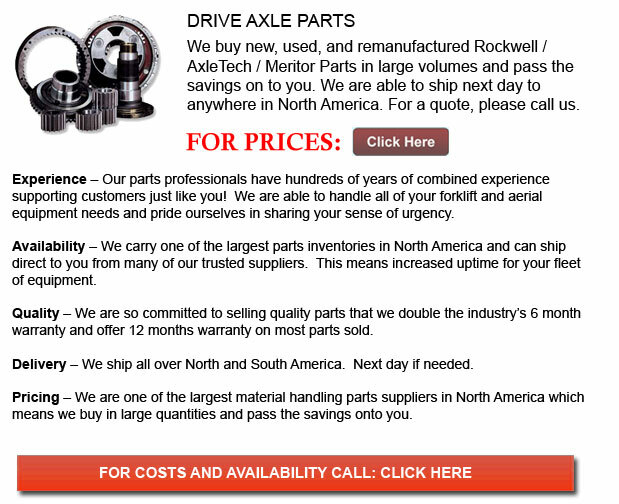 This particular kind of drive axle is elastically attached to the vehicle frame utilizing back bearing parts on the extension arms along with frontward bearing tools situated on the axle body. There are two rear and two front bearing devices. Each one is separated in the transverse direction of the lift truck from the other bearing device in its respective pair. The braking and drive torques of the drive axle on this model of forklift are sustained utilizing the extension arms through the back bearing elements on the frame. The forces generated by the lift mast and the load being carried are transmitted into the floor or street by the vehicle frame through the front bearing elements of the drive axle. It is important to be sure the elements of the drive axle are put together in a rigid enough manner to be able to maintain stability of the forklift truck. The bearing elements could reduce minor bumps or road surface irregularities during travel to a limited extent and provide a bit smoother operation.